Representatives from Higher Education and Further Education institutions joined forces with local Army units to attend the region’s first West Midlands Military & Academic Partnership (MAP) Symposium. The event was hosted by 11th Signal and West Midlands Brigade at the Army Reserve Centre in Wolverhampton, home to 4th Battalion the Mercian Regiment. The symposium aimed to develop a better understanding of the opportunities available through partnerships with Higher Education and Further Education institutions and the military, as well as identifying good practice in those communities who currently work together. 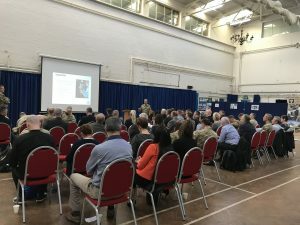 Representatives from Army units around the West Midlands spoke about the military’s perspective and their current collaborations with education institutes, including projects with Wolverhampton University and Aston University Engineering Academy. Key speakers from educational establishments in the Midlands and the West Midlands Military Education Committee gave an academic perspective and discussed how education could gain military support to reach their educational outputs. A special presentation was also delivered by the Lee Rigby Foundation who raised awareness of their ongoing and future projects. During the event Birmingham-based organisation The Education Awards also formalised their commitment to support members of the Armed Forces community by signing the Armed Forces Covenant. As part of their pledges the organisation hopes to support local schools, communities and cadet programmes and promote education programmes run by the Armed Forces. 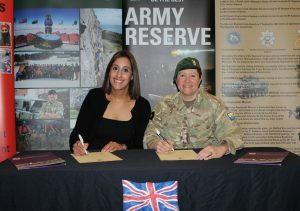 Colonel Rosie Stone, Deputy Commander Reserves at 11th Signal & West Midlands Brigade said of the event: “The military places great emphasis on trades, technical skills, education and personal development, therefore developing a strong relationship with our local academic institutions is very important. We have much to benefit from working and learning together.